Event Equip has a mobile bar that can be hired. We have many different optins in which the bar can be hired to suit your event, options such as hiring the bar and customers paying for their drinks, a free bar option and also the choice to hire our staff to run your bar for you on the event. Feel free to contact us for further information on our bar hire. If it is not kitchen equipment you are wanting to hire, then why not take the option to hire out our fully equipped catering kitchen to complete the job. We have all the latest kitchen equipment in a very spacious catering kitchen where you can prepare and cook your food for any event. Contact us for further details on hiring out our catering kitchen. We have a wide range of kitchen equipment available for rental, all our equipment is available for daily rent and you can rent them for more than one day if you require. We also have a delivery or pickup option on all equipment. To see all our available equipment click the button above or contact us if you have further questions or require any further information. Event Equip can offer many services for catering such as equipment hire, bar hire and kitchen hire. Why choose Event Equip? We have over 65 combined years’ experience in the in the hospitality and catering sector, our experience shouldn’t be taken lightly having owned & worked in 5* hotels, restaurants and owned successful outside catering companies. We know what equipment you will need to run a successful event. At Event Equip Hire we pride ourselves on providing an extensive range to the catering trade and event organisers for corporate and private events as well as dealing direct with the public. We are geared to meeting exacting delivery timescales and trained to understand the internal workings of individual venues. 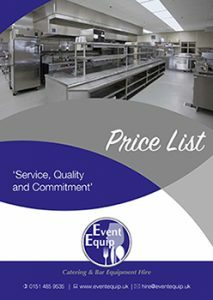 Providing catering equipment and kitchen equipment hire to Merseyside and the Northwest, Event Equip is one of the northwest catering equipment hire specialists. We have a table setting for every palette, a glass for any beverage and some luxurious linen, we have a fantastic selection to choose from to create the perfect cover for any event or occasion. From sit-down dinners to canape receptions. As catering hire specialists, we work on functions of any size from small family celebrations to large-scale corporate hospitality events. We operate in Liverpool, Cheshire & Manchester and the Northwest providing catering & kitchen equipment hire. Our back-of-house kitchen equipment is serviced and maintained to a high standard from refrigeration and cooking equipment through to preparation, storage and utensils we can assist with all your kitchen hire requirements. From our depot we deliver to your event direct and collect afterwards. If you would like to look at any of our catering ranges prior to placing your order call us and arrange a viewing at our premises. For an additional charge we will wash and clean hired items on return to our premises. Don’t forget we also stock a large supply of Cooking equipment, kitchen equipment, refrigeration, crockery, cutlery, BBQ equipment, tableware, beverage service ware & bar equipment hire service ware equipment and accessories including tables, chaffing dishes, flasks, ice buckets and table number stands and much more. Call us now for a quote on 0151 485 9535 or contact us via email, hire@fscco.uk .